After a failed bank robbery, a young criminal tries to stay away from the police during a chaotic night in New York City. 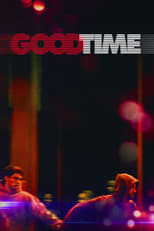 Good Time is directed by Benny Safdie & Josh Safdie and was released on Aug 25th, 2017. Director Benny Safdie, Josh Safdie's Crime & Drama movie Good Time is produced by Elara Pictures & Rhea Films & was released 2017-08-11.